A wedding is an extraordinary event in one’s life, and most couples spend considerable time ensuring that everything is perfect. Careful planning is the key to a successful and beautiful day, as there are so many details to consider. But this should be a pleasurable experience as it gives the bride and groom the opportunity to imprint their unique personality on the occasion, sharing the love they have for each other with family and friends. The wedding invitation, as the first public announcement of their joining, is a beautiful and sentimental keepsake. 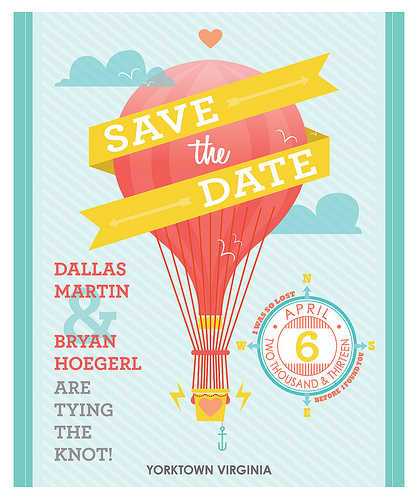 A wedding invitation isn’t just about letting people know the location and date. It sets the tone of the entire affair and indicates the formalness of the event. Is the wedding to be traditional, classic and elegant or modern, glamorous and stylish? Do you have a special theme, such as a wedding on the beach, a gathering in a wooded area, a traditional Irish ceremony or a Medieval affair? 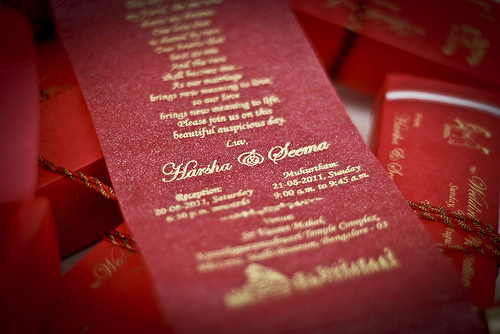 The invitations introduce the personality of the occasion. Visit stationary designers’ websites and online photos of invitations for inspiration and ideas so you have a clear vision of what you’re looking for. For colors, white, cream or ivory with a black or gold font is classic if your wedding is formal, but for less formal occasions, there are no set rules. You can select more colorful or metallic type, paper, envelopes and liners for greater visual appeal. Just make sure the type style is not overly ornate, and that the ink and background colors are adequately contrasted so that the invitation can be easily read. Stay away from light text on light backgrounds and dark text on dark backgrounds. 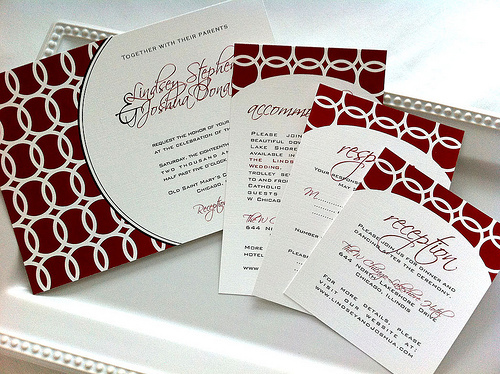 The standard size and shape of wedding invitations is 6.25 inches by 4.5 inches and rectangular. However, you’re certainly not beholden to that and other invitation shapes are available. 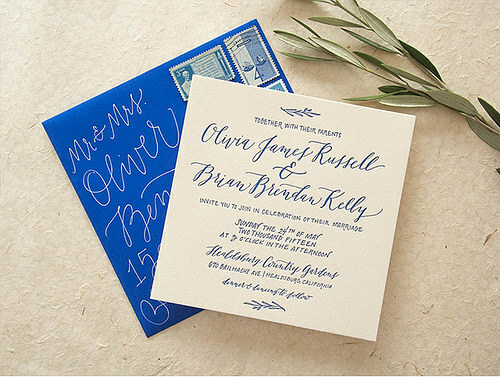 There are many variables to create your own unique wedding invitations, such as the design, the type of paper, ink color, typeface and special printing techniques such as engraving and letterpress. You can also use a custom design and include decorative touches such as enclosures and envelope liners. Hiring a calligrapher to address the envelopes adds an exquisite, personalized touch. Many varieties of paper stock are available. A heavier paper feels more luxurious, but you can also choose linen paper with a textured surface. Do you prefer a matte finish or metallic paper? You’ll also find natural paper stock such as bamboo, imported papers and rustic recycled papers. Deciding on the typeface (font) can be a dizzying adventure in itself. There are many to choose from, so narrow it down by your wedding theme. Is the affair to be casual or formal? Traditional or modern? Are you being married on the beach or in a formal and elegant cathedral? There are typefaces that are formal and traditional, informal and whimsical, contemporary, high-tech and retro. Choose a font that will capture the personality of the couple and the occasion. Once you’ve selected the paper and the typeface, what type of printing would you prefer? There’s offset (flat) printing, thermography, letterpress and engraving. Thermography gives you raised print using special inks and heat. In the letterpress technique, letters are pressed into the paper. Engraved print is raised from the paper. Although there’s key information you must convey, a printed wedding invitation is a work of art, so placement of text and a balance of white space is important. Not only will the invitation look better if it isn’t jam-packed with non-essential information; it will also be far more legible. Include the location, date and time of the ceremony; the hosts’ and couple’s names, the dress code for the occasion (if there is one) and RSVP details. Any directions and information about the reception should be either on separate cards enclosed with the invitation. With all the choices for unique and beautiful wedding invitations, you can create a stunning masterpiece of your very own.